When I was in Homer (when I was in Alaska), Katie and I were staying with her friend and her parents, and we took a boat trip out to this island where we cooked ourselves a little picnic on a big campfire. 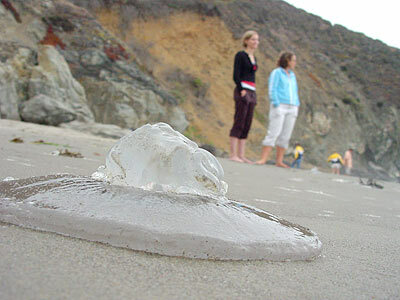 We found a beached jellyfish with no tentacles and played with it -- very fun. When we finally got bored of its gelatinous goodness we threw it on the fire. It was amazing! It didn't cook or burn at all, just the water slowly evaporated out of it and it got smaller and smaller.